Poland is a country with large tracts of rolling plains with arable land but also large forested areas, especialy in the west as well in the north-eastern part of the country. Although the landscape resembles that of Germany, it is less modernised and has preserved more traditional elements as well as natural habitats. Not strange it has quite a few old trees, as well in old, nearly primeaval forests as individual veteran trees in the countryside. One of the last ancient Elms. In a small village called Komorov in Western Poland this imposing Elm-tree ( Ulmus spec.) stands, one of the last ancient Elms of Europe. It has a girth of 9,3 m ( 31 feet) and is thought to be 440 years old. It is still a tree of solemn presence, with a rather full crown and notwithstanding the hollow trunk. 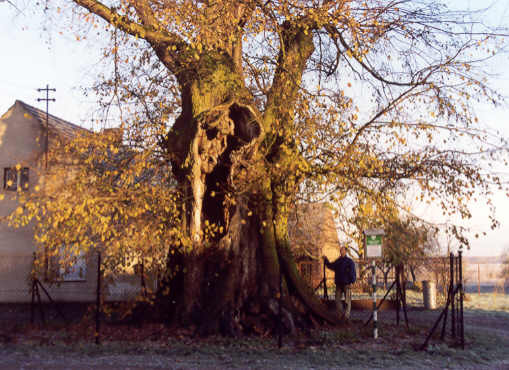 During the past century millions of Elms have been killed by the Dutch elm disease, so it is remarkable that such ancient specimens still exist. It is not known if these individuals are more resistant to the disease or just have not been visited by the responsible beetles and fungus. See also the Elm-page. Four giant oaks in Poland. This giant was known in the beginning of the 20th century but had been forgotten, while it stands in a very remote place somewhere in western Poland. Recently it was rediscovered. 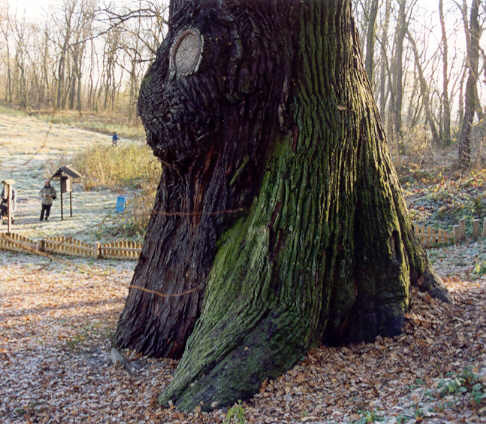 It is the biggest girthed oak of Poland and has a girth of 10,43 m (34� feet). A Polish dendrologist has done tree-ring research on the oak and calculated its age as about 650 years. Because the oak is totaly hollow, this can only be an extrapolation, while only the about 100 outer yearrings can be counted. The same oak in another perspective. A Royal Oak of tremendous size. Here the Dutch tree-expert Jeroen Pater stands aside of a giant Polish Royal Oak, to my opinion one of the most impresive oaks of Europe. 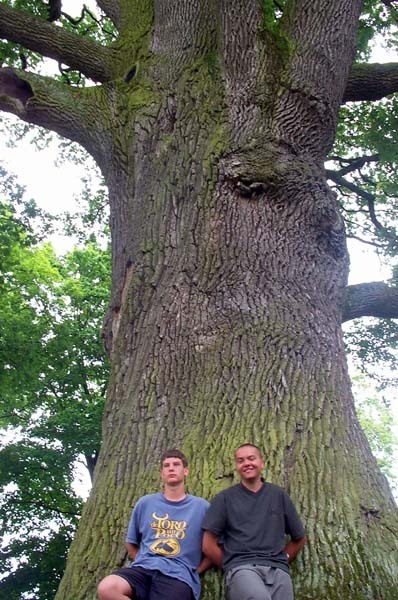 In all of Europe to my knowledge it is second in stemvolume ( over 90 m3 = 3200 cubic feet) only to the great oak of Ivenack, Germany and perhaps to "Majesty" the Fredville Oak of Kent, England. It has a girth of 9,92 m (33 feet) and a huge bole rising up like a column to 8 m (26 feet) and keeping this girth up to 4 m (13 feet) height. According to tree-ring research it is about 730 years old. The Oak "Rus" in Rogalin, near Poznan. South of the old city of Poznan, Poland, lies the old estate of Rogalin. It is known for its large collection of old oaks. 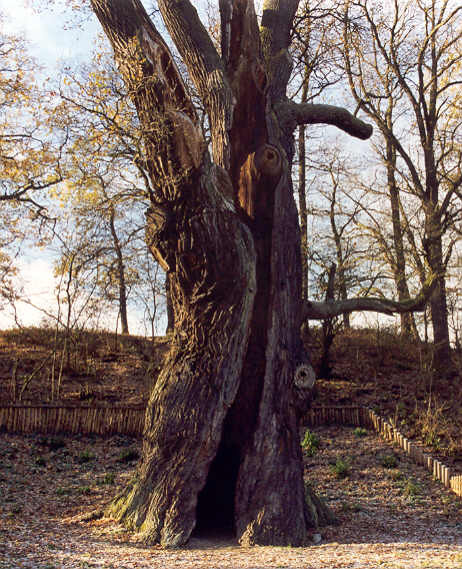 The most famous and biggest of them is this one, the 'Rus' - oak, with a girth of 9,10 m and an age of around 600 years. 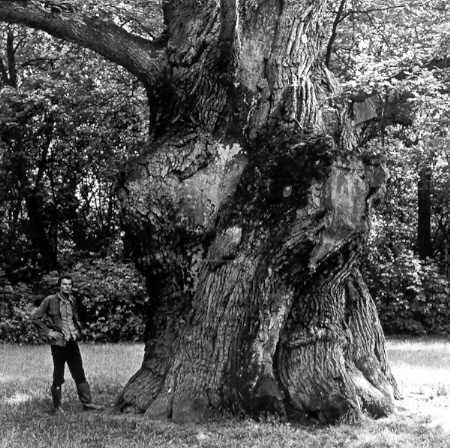 Here a picture of the oak with me in 1976, taken by Arjan Lindenberg. This picture I got of Andr� Skibinski (Skiba), a Polish man living in Holland. It represents the old oak called Dab Bolko (Dab is Polnish for Oak). It can be found near the village Wola Uchruska, near Sobibor at the Ukra�nian border. 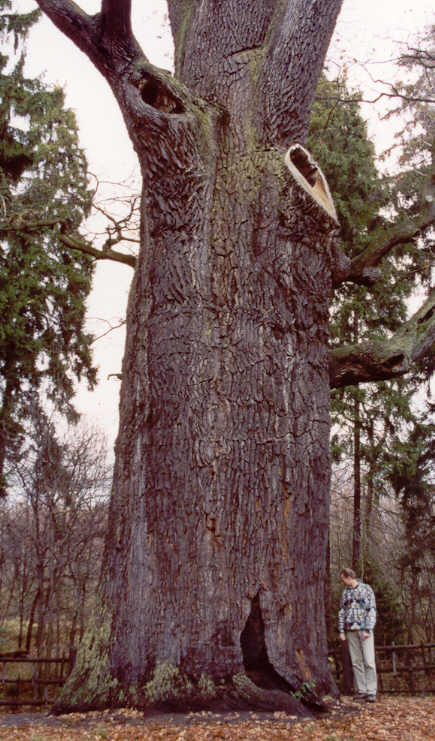 The oak has a girth of 860 cm and to the opnion of mr. Skiba should be around 600 years old. More pictures can be seen at Skiba's own website. In Eastern Poland and White-Russia the enormous Virgin Forest of Bialowieza lies . Parts of it are a National Park because of its very well preserved virgin (or 'old-growth' ) forests , were huge firs, pines , oaks , limes and other forest giants can be found.